Finally an improved Sweet Bay Magnolia that is more cold hardy with semi-evergreen foliage. Moonglow Magnolia is a vigorous upright growing magnolia with an oval shape. Maturing in the 35 foot height range, the Moonglow spreads up to 18 feet wide. 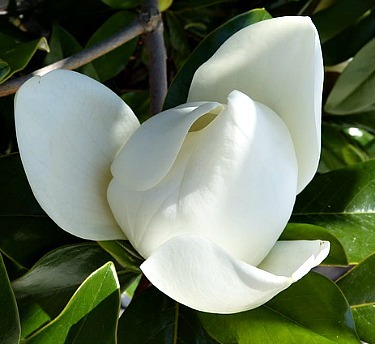 The Sweetbay Magnolia is known for its wonderfully scented flowers in late spring and the Moonglow is even better with larger sized creamy white flowers that emit lemon scent during May and June. The semi-evergreen foliage of this southeastern US native, are glossy dark green on top with silver-green on bottom. The Moonglow Magnolia produces cone shaped fruit that matures in fall with red seeds. Grows well in moist soil areas such as near ponds or low level settings. Excellent when planted near outdoor sitting areas to enjoy the lemon scented spring flowers. Also, a natural planted near woodland gardens. As with the Sweetbay Magnolia, the Moonglow is noted as growing into zone 5, but we would recommend protection for zone 5 areas. Moonglow Magnolia is grown as a single cane tree in a one gallon container which will be removed for shipping. Orders shipping to CA or AZ will be fully bare rooted before being prepped for shipping.